It's a sad thing, listening to those clips and really feeling nothing. A few months ago, I would have been bouncing off the walls. Maybe whoever it was got in trouble for posting it. Or maybe it was Ryan. That Reddit website is confusing as hell. How does anyone follow what's going on? I think its easier if you go next to sort, and then click the drop down, and select "new". Likely, actually have a 20 dollar bet on this. Not sure how but I think that it will go up on itunes on "accident" and be taken down. Jesus, it's only been eight weeks since the article?!?! Feels like way more. Just counted because I was idly wondering if it would be about the time ol' RyRy would be emerging from whatever residential program he entered the week the article appeared. Do you think he entered a program, or just holed himself up in his house? There was a post on a facebook group from someone who said that Ryan texts her sometimes and "hasn't learned much" from this whole ordeal. It's a pretty disappointing bit of news, if it's true. Damn bold bet! Rooting for your victory tho. Def wanna spin the record. I don't know if im confident enough to bet that it'll release this week. I feel like it wont. Do you have a screengrab of that post? I doubt he's in a program, and I fully believe he just feels ganged up on. Narcissism is incredibly powerful. Still, I'm stunned that there hasn't been paparazzi or Pax-Am sightings. Dude can't be anywhere but LA or NYC. If I can find it, I'll post it. A lot of drama happened surrounding the post, so it may have been deleted. Also, facebook has been in a weird habit lately of not showing posts chronologically, so it can make it really hard to find what you're looking for. He could also be in the one place people would never think he would go: Jacksonville. maybe he’s in FBI custody? I imagine we'd probably have heard about that by now. Literally cannot imagine anything that would keep him off the socials other than being in a residential program without access to said socials. Last edited by hi_there; 04-16-2019 at 08:13 PM.. I just have a hunch he hasn’t stayed off social but that he’s engaging under aliases. I know it’s all speculation, but there’s some accounts I’ve happened to notice that fit his behavior to a T. So my theory is is lawyers probably told him to stay off and maybe he goes the anonymous route instead. Seems far fetched, but then he’s been known to even join his fan forums...so who knows. Of course it could very well be that he is in seclusion or treatment instead, but I like to play detective. 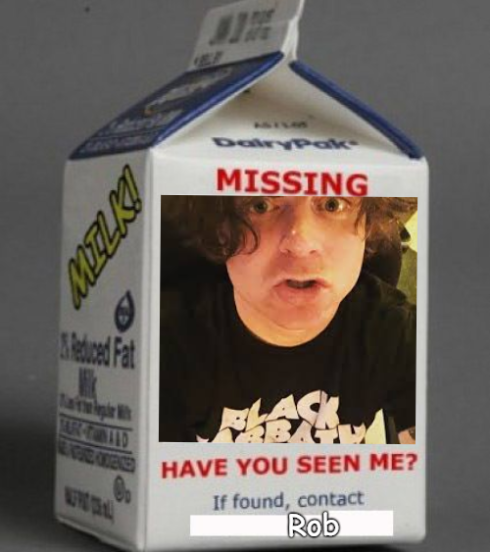 Dammmnnnnn look at the size of those pupils in that milk carton pic. Snort Adderall much, Ryan? I'm really wondering what will happen on friday. If the streaming services etc have access to the album I wouldnt be surprised if it accidently ends up on one of them for a short period of time. Just enough time for some eagle eyed person to download and leak. I doubt if they had it 8 weeks ago however. Does make you wonder if any copies of the vinyl had been pressed. With RSD you would have thought this should have been done months ago. Also pretty sure Ryans not going to emerge this year. He was talking about extended time out after this year, I imagine this has just brought it forward. Im thinking its going to be years. He'll go into some program then live the quiet life for a while.